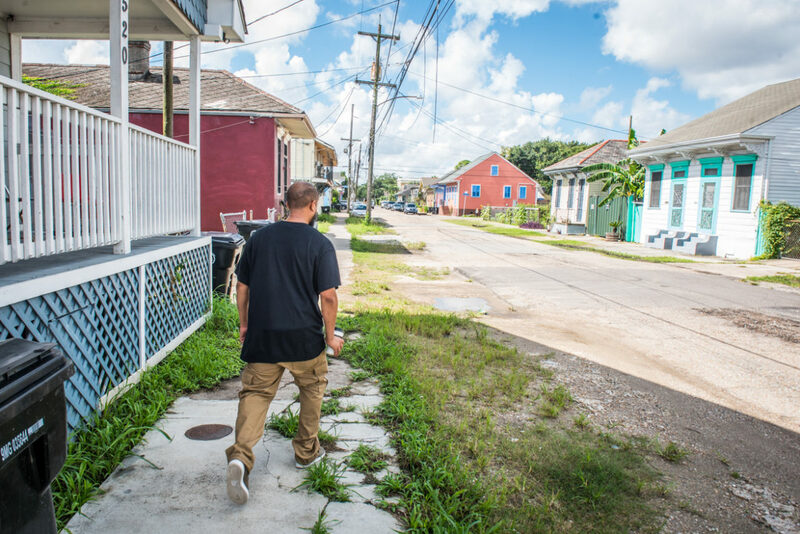 Melon takes the short three-block walk from his childhood home to his current house in the Seventh Ward. "It feels like my entire block is a hotel," he said. Patrick Melon stands on the porch of his grandmother’s old home, where he grew up. It now displays a short term rental permit in the window. 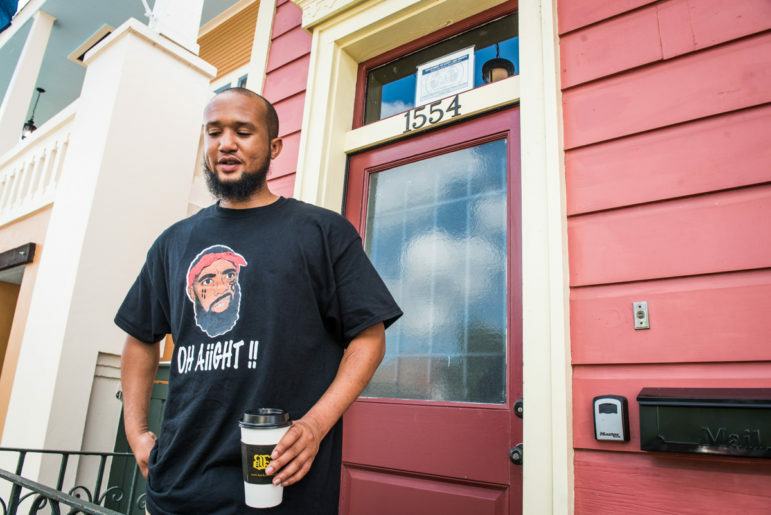 “It feels like my entire block is a hotel,” said local photographer Patrick Melon outside of his Seventh Ward home. It only takes a minute to walk over to the house he grew up in — one half of a double shotgun that his grandmother used to own. That property was registered with the city as a short-term rental in 2017. His grandfather, uncles and aunts were also raised nearby. Melon said his own landlord told him that his house might be converted as well. Stories like Melon’s are not hard to find since the City Council voted to legalize short-term rentals in 2016. The ordinance, backed by former Mayor Mitch Landrieu in consultation with Airbnb, was lauded at the time as a prototype for other US cities. Short-term rentals were illegal in New Orleans before the law was passed, but the city did little to enforce the ban, allowing the local market to explode. Though the law allowed the city to regulate short-term rentals, it created few barriers to getting a license. Critics said little consideration was given to the negative effects of short-term rentals seen across the country. As of April — a year after the law went into effect — there were nearly 4,700 short-term rental properties in the city, the majority of which allowed for whole-home rentals. Seven months after the law took effect, an analysis by The Lens and HuffPost showed that the proliferation in rental units was significantly transforming many of the city’s most distinct neighborhoods, appearing to accelerate resident displacement in areas that were already vulnerable to gentrification. In some places, short-term rentals made up 10 percent of residences, the report showed. Short-term rental advocates have said that the practice gives New Orleans residents a greater stake in the city’s massive tourism economy, long dominated by hotels that often pay low wages. They also point to short-term rental hosts who have renovated blighted properties. But even some on that side of the argument concede that some New Orleans neighborhoods have become overrun with short-term rentals. 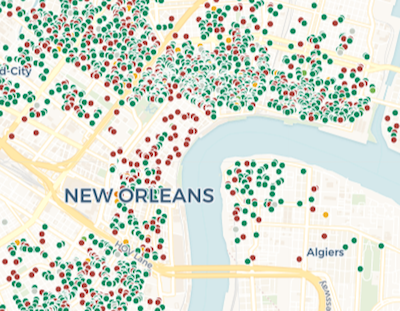 Use our Airbnb tracker to see how many short-term rentals are in your neighborhood. Many of the local negative impacts — such as displacement, rising housing costs, and disruptions to the city’s social fabric — are difficult to measure quantitatively or connect directly to short-term rentals. Some studies have shown that this type of large-scale commercial investment in residential neighborhoods can lead to higher rents and steeper property taxes for existing residents. Still others, including a New Orleans study funded by Airbnb, have found that the short-term rental market has little effect on rents. But Melon said the connection is obvious. The growth was so rapid that last May, the City Council placed a moratorium on the issuance or renewal of the most popular type of license in the neighborhoods where short-term rentals were most popular and instructed the city planning commission to conduct a thorough study of their effects. “We did not get this right in 2016,” said Breonne DeDecker, program manager for the Jane Place Neighborhood Sustainability Initiative. Jane Place was among the most vocal opponents to the short-term rental law passed in 2016. “We left our neighborhoods and our communities extremely vulnerable to short-term rental speculation and rampant investment that’s fueling a lot of gentrification,” she said. The city planning commission’s study is due later this month. At that point, the City Council may choose to overhaul the way the city regulates short-term rentals. DeDecker is making sure that community groups like hers, rather than platforms like Airbnb, are leading the conversation with city officials. Working with community members and the Lawyers’ Committee for Civil Rights Under Law, Jane Place has drafted an ordinance that would create a far more prohibitive regulatory structure for short-term rentals. The proposed ordinance would require applicants to show proof of residency at the property they intend to rent out. And it would also require the platforms — Airbnb, HomeAway and others — to obtain city permits. Council members, community groups, and short-term rental platforms have all made suggestions for how to improve the existing law since City Council signaled that it would change the laws. But Jane Place is offering a comprehensive, legally vetted ordinance that the City Council could vote on and codify in the city’s zoning law. “We’re trying to show a path forward to City Council and say, ‘This is what average New Orleanians are asking you to do,’” DeDecker said. The authors of the new ordinance — Residents for Ethical and Sustainable Tourism Ordinance (REST) — are striving to correct what they see as the major mistakes of its predecessor. In the months after short-term rentals were legalized, it quickly became clear that the licenses weren’t just used by locals seeking some extra cash. Short-term rentals had become a significant subset of the hospitality industry. In several cases, property owners and management companies — some from out of state — were operating dozens of short-term rentals. A report from Jane Place found that in March 2018, the largest 10 operators had a combined 568 listings. The top host was based in San Francisco and had 124 listings, the report said. The REST ordinance would limit licenses to Orleans Parish residents, and effectively limit residents to one whole home rental each — in their own homes — by requiring applicants to have a homestead exemption at their short-term rental property. Under current law, only accessory licenses — one of the city’s three types of short-term rental licenses — have a similar requirement. As of Wednesday, there were 1,143 active accessory licenses issued by the city, about 30 percent of the city’s total licenses. During the profusion of community meetings held on these regulations over the past few months, some have suggested that the city should limit short-term rental licenses to those with homestead exemption in Orleans Parish, but allow those people to rent out multiple homes. But DeDecker warned that would put the city at risk of circling back to the same position it’s in now. Others have said that the city shouldn’t use homestead exemptions at all and that instead, it should focus on density control measures. The Alliance for Neighborhood Prosperity, a local group supportive of short-term rentals, recently partnered with rental platform HomeAway to hold community meetings and create a list of their own policy proposals. They suggested that the city create two density limits: two short-term rentals per block face and three percent of total housing units per census tract. At one of the community meetings, Alliance for Neighborhood Prosperity President Eric Bay said that the block face limit would not apply to existing permits. While density limits may sound fine in the abstract, DeDecker said there are too many unknowns about their practical implementation. “I don’t think the city can afford to experiment again,” she said. The homestead requirement her group is proposing would be simpler to enforce and would result in a decrease in short-term rental density, she said. And, she added, there is no guarantee that density controls would achieve one of her group’s primary goals: returning housing units that would be ineligible for short-term rental licenses to the residential market. Another key component of the REST ordinance is new regulations on hosting platforms. For this aspect of the ordinance, its authors took cues from the city’s regulations on ride-sharing platforms like Uber and Lyft. Rental platforms would be required to establish an office in Orleans Parish and obtain an occupational license from the State Department of Revenue. The responsibility for collecting and remitting hotel taxes would also shift from the host to the platforms, something Airbnb has already been doing as part of an agreement with the city. The ordinance adds a $20 per night fee that would go to the city to help it cover enforcement costs. Currently, there is a $1 per night fee on short-term rentals for the city’s affordable housing fund. The ordinance requires platforms to list the proper registration number for each listing on their websites and remove all unlicensed residences. Airbnb had been voluntarily listing registration numbers, but recently stopped when the City Council initiated the freeze on certain licenses. “Unless we can actually force them to remove those illegal listings we’re just going to be playing whack-a-mole with illegal operators until we’re blue in the face,” DeDecker said. The platforms would also have to improve data-sharing with the city. They are currently required to submit monthly reports on bookings, but the reports don’t show the names and addresses of operators. With this ordinance, those reports would have to include extensive information about each distinct listing including its permit number and corresponding contact information, the total number of nights it was booked, the amount of rent paid, and the amount of taxes and fees paid to the city. The platforms will also have to submit a quarterly report listing all complaints of discrimination they’ve received. 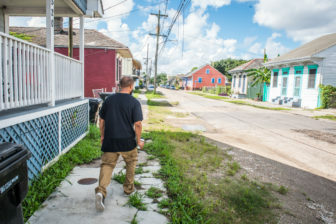 Melon takes the short three-block walk from his childhood home to his current house in the Seventh Ward. “It feels like my entire block is a hotel,” he said. While the ordinance is far more restrictive than existing laws, its authors say it was informed by what’s worked in other cities. Along with the ordinance, they also produced a chart comparing the ordinance’s components with cities like Nashville, Austin, and San Francisco. She said that the ordinance will also help local short-term rental operators by omitting competition from corporate, large-scale operations. DeDecker is working to create a coalition of support for the ordinance among community members and other organizations in New Orleans. And she said she’s optimistic that a council member will submit it for official consideration. She’s already shared the ordinance with at least three council members—Joseph Giarrusso, Jay Banks, and Jason Williams. Representatives from Giarrusso and William’s offices said they are waiting to receive the report from the City Planning Commission before committing to any specific policy proposal. Banks couldn’t be reached for comment. Melon, like DeDecker, said she sees the benefit of short-term rentals when used properly. He said he stays in Airbnbs himself when visiting other cities. He said the city has to act to protect the people who shape New Orleans culture and make it an international destination in the first place. Proposal would limit residential short-term rentals to owners with a homestead exemption and place caps on commercial short-term rentals.